Kevin Farrell ’22, a student in the First-Year Learning Community “Creating a Human Material World,” checks out the display of Wagner antiques. “The creation of objects, in many ways, is essential in understanding ourselves and what and who we are,” said art history professor Sarah Scott, as she introduced the Wagner Antiques Roadshow. 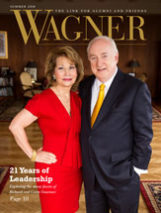 This special event was held as part of the Homecoming 2018 festivities to honor Wagner’s 100th anniversary on Grymes Hill. 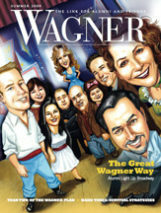 Inspired by the long-running PBS television show in which experts evaluate antique objects brought in by everyday people, the Wagner Antiques Roadshow featured a panel of Wagner staff and faculty who commented on Wagner-related objects in the College’s collections and contributed by alumni. "Regulation green freshman caps," or dinks, explained at the Wagner Antiques Roadshow. 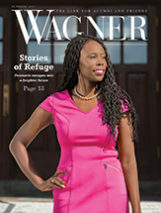 Although the Wagner antiques have no great dollar value, they are extremely valuable as a means of remembering and passing along the history and culture of the Wagner College community. A Wagner beer stein owned by Betty Henriksen ’65. Diverse objects sparked conversations about varied aspects of the campus culture throughout the past 100 years. They included “regulation green freshman caps,” as they were called in the 1949 student handbook (they were also known as “dinks”); a belt buckle, an ashtray, and a beer stein featuring Wagner images; fraternity and sorority paddles; Main Hall’s interior door handles engraved with the Luther rose; an LP record album with a photo of Reynolds House; and an 1899 edition of Uncle Tom’s Cabin owned by George J. V. Schorling, Wagner class of 1911. A Main Hall door handle engraved with the Luther rose. During the fall 2018 semester, students in the First-Year Learning Community “Creating a Human Material World: Objects, History, and Memory,” (taught by Scott along with history professor Brett Palfreyman) are writing catalogue entries for the objects discussed at Homecoming. Plans are in the works to create an exhibit of these objects for Reunion 2019. Diane Wehrli Mathisen ’79 holds a metal Wagner belt buckle owned by her father, the late Bill Wehrli ’53; Aletta Kipp Diamond ’65 H’15 contributed her Alpha Delta Pi sorority paddle.